StatMap Earthlight is a fully-featured GIS product build specifically for the Web. Earthlight is unique in the marketplace featuring full editing capabilities together with a highly scalable design. Scalability – Hundreds of users served from a single server. User Experience – A rich Internet application that looks and feels like a desktop product. Performance – No waiting around. Works faster than a desktop GIS. Architecture – Designed specifically for the web using future proof technologies such as the Microsoft .Net Framework. All administrative tasks can be performed via a browser. Users and GIS data are managed via the Earthlight user interface directly from the web. This avoids many administrative headaches with installing separate applications and configuring admin applications on technical support staff’s PCs. All data is stored centrally on the server making backing up your installation a hassle-free process. This is especially useful where IT services have been outsourced to a third party as there is no Earthlight-specific backup and restore procedure involved. Edit using the same tools that you would use in a desktop GIS but in a web browser instead. With Earthlight you are not restricted to adding just points as you are in some other products. You have full editing capabilities. You can create, edit and delete points, lines and polygons and combine these together into geometry collections. Manipulation of existing objects is easy with our editing tools which include buffering, merging and slicing. 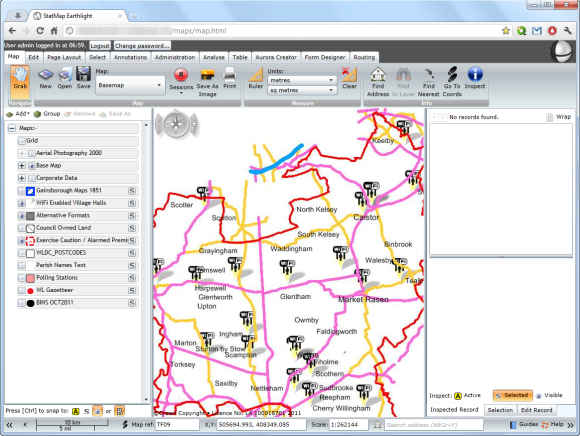 A common GIS task is to create a new feature from a set of existing ones. With Earthlight you can use our trace function to easily trace round existing features. This tool is so easy to use it doesn’t require any training and is much simpler than anything competing products provide. Earthlight has a modern, clean user interface with end user productivity in mind. It includes an Office-style ribbon toolbar familiar to users of Microsoft Office 2007. All available features are easily accessible via this toolbar. Works with PostgreSQL, Oracle 10, 11 and SQL Server 2008. The data is stored in the native PostGIS, Oracle and SQL Server spatial formats allowing seamless interoperability with other GIS products. You can also use file-based data via the standard Shape, Tab or Mid/Mif formats. Earthlight works equally well with both raster and vector data. Earthlight customers receive a free copy of our OS MasterMap loading software called Courier. Courier is the fastest and easiest-to-use MasterMap loading package on the market. Thanks to our advance rendering capabilities you can see your MasterMap data exactly as Ordnance Survey intended. We fully comply with the MasterMap styling guidelines. Earthlight has been designed to work quickly without interrupting a user’s workflow. Once you open a map and add a new layer it appears instantly on the screen. There’s no waiting around for a minute or two wondering what has happened. Earthlight is as fast or faster than Google Maps and Microsoft Virtual Earth. Earthlight’s design allows the application to be highly scalable. We can support hundreds of sessions on a single server. All sessions are isolated from each other so a problem in one session can’t bring the entire system down. Printing is provided via the industry standard Adobe PDF format. Maps can be emailed or saved in this format or sent straight to the printer. Users have the ability to customise print layouts as needed using a simple-to-use print layout editor. Print sizes up to A0 are supported. With our advanced rendering engine you can use techniques such as semi-transparency and bitmap polygon fills to make each layer or display query stand out clearly on the map or more closely match its real world equivalent. Easily perform database and spatial queries on your data. Ask questions such as find the number of schools within 5 km of a point or how many people live within the boundary of a political ward. Thematic maps can be built by colouring different polygons depending on their attributes. For example you could build a map of crime statistics that colours areas different based on their susceptibility to crime. Query results can be viewed in popular database and spreadsheet products such as Microsoft Excel. Earthlight was designed to be a web-based application. It is not a redesigned desktop product like many other competing products. Earthlight is a multi-tier application with scalability designed into it from the beginning. Earthlight is a 64-bit application meaning that it can take advantage of modern servers that have huge amounts of memory available to them. Earthlight is cross platform and works on Microsoft Windows and Apple OS X. Internet Explorer, Firefox, Chrome and Safari browsers are supported. We are also working on a version for mobile phones which will allow live, in-the-field updating of spatial data from these devices. Earthlight doesn’t compromise your network. The only connection it needs is to the database where the data is stored. Earthlight can be safely deployed on the Internet or a company Intranet. It requires neither special configuration of the web server (IIS) nor changes to your firewall.